MainAll NewsInside IsraelBlair engineered Herzog-Netanyahu unity talks? Blair engineered Herzog-Netanyahu unity talks? Former British PM and Quartet envoy reportedly led the failed move to add the Zionist Union to the coalition. Former British Prime Minister and Quartet envoy Tony Blair was one on a list of several international figures behind the failed move designed to legitimize the addition of the Zionist Union to the coalition, Haaretz and Channel 10 News revealed on Wednesday. Two sources in the Israeli political system quoted in Haaretz said that Blair, while coordinating with and updating opposition leader Yitzhak Herzog and U.S. Secretary of State John Kerry, is the one who pushed and encouraged Egyptian President Abdel Fattah al-Sisi’s speech in which he called on Israeli political parties to agree on the need to advance the framework for peace with the Palestinians. Of course, it appears that the move has failed for now, as Herzog froze the talks with Prime Minister Binyamin Netanyahu on Wednesday, after the latter turned to Yisrael Beytenu chairman Avigdor Liberman and offered him the Defense Ministry if he joins the coalition. While an announcement on Yisrael Beytenu joining the government has yet to be made official, the sides are engaging in talks and sources on both sides said Wednesday night Liberman could join the coalition as soon as Thursday. Haaretz noted in its report that although Blair ended his stint as Quartet representative to the Middle East months ago, he has continued to act independently to restart the peace process between Israel and the Palestinians, and Israel and the Arab world. 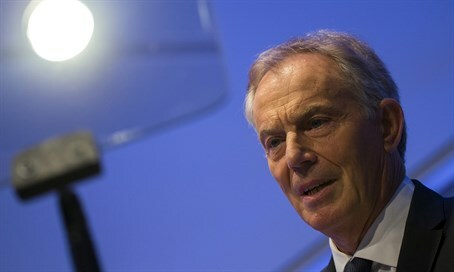 Blair visited Israel and other countries in the region every two or three weeks, almost always meeting with Netanyahu as well as Herzog, updating them on his talks with Arab leaders, according to the newspaper. Blair’s consistent message during these meetings was that Sunni Arab nations are willing and prepared for a breakthrough in relations with Israel, but it depended on steps Israel took in Judea, Samaria and Gaza to demonstrate advancement of the two-state solution. Political sources involved in the matter were quoted by Haaretz as having said that in recent weeks, against the backdrop of Netanyahu and Finance Minister Moshe Kahlon’s agreement on passing a two-year budget (instead of one year at a time), Blair realized that the Israeli government would stand firm until 2019. Blair thought the only way to advance a diplomatic move between Israel and the Palestinians, with the involvement of Arab nations, would be to bring the Zionist Union into the coalition. Last week, while visiting Cairo, Blair reportedly worked on recruiting senior Egyptian figures to the plan. One political source says Blair is the one who suggested that Sisi make the speech he gave Tuesday with a message to the Israeli people and their political parties about the need to move forward in the peace process with the Palestinians. According to the source, Blair’s activity vis-à-vis the Egyptian presidential office was fully coordinated with Herzog. Blair also coordinated with Kerry, informing him of the talks with Herzog, Netanyahu and Sisi. A political source quoted by Haaretz said that subsequent to Blair’s actions, Kerry considered putting off publishing a Quartet report criticizing “Israeli settlement construction” until he knew whether the Zionist Union would join the coalition. American officials have denied this claim. Until Tuesday afternoon, the report continued, all was going according to Blair’s plan. Sisi gave the speech with the messages Blair had coordinated with Egypt. Herzog hastened to announce that he applauded the speech and said that Israel should not miss the diplomatic opportunity. A few minutes later, Netanyahu also made an announcement welcoming Sisi’s remarks and saying he was willing to cooperate with a diplomatic move led by Egypt. But in the following hours, talks between Netanyahu and Herzog started to fall apart and finally collapsed just after midnight, leading to his turning to Liberman. According to Haaretz, Netanyahu realized that Herzog did not have the backing of a majority of his Knesset faction for joining the coalition, and didn’t want to take the risk of making such far-reaching diplomatic undertakings. Blair’s office did not wish to comment. Herzog’s office also declined to comment. The U.S. State Department also did not respond to a request for comment.